Aberdeen have signed the former Inverness CT striker on a two-and-a-half-year deal. Aberdeen have completed the signing of former Republic of Ireland under-21 international Adam Rooney from Oldham Athletic. The 25-year-old has signed a two-and-a-half-year deal at Pittodrie, after being given permission to leave the Latics. Rooney joined Oldham in 2013 after a two-year spell with Birmingham City, scoring seven goals this season, including the winner over Wolves in the FA Cup. The Irishman joined Inverness Caledonian Thistle in 2008 from Stoke City, and played a significant part in helping Terry Butcher's side reach the SPL in 2009/10, scoring 24 goals. His form continued into Scotland's top flight, where he scored 15 goals on his return. Such form prompted interest from Birmingham, who signed the forward in 2011/12. Derek McInnes was delighted to secure the forward, telling the Aberdeen website: "Adam is a proven goal-scorer and he has the quality to add something to our team. 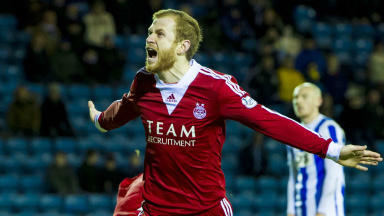 "There were other clubs keen to take him and it's great that he wants to be part of what we're doing here at Aberdeen. "I've said all along that I'll only bring in players who I believe will add something to the squad and Adam certainly ticks that box." Aberdeen have been looking to bolster their forward options this winter. While Derek McInnes' side have won seven of their last nine matches, goals from the centre-forward position have proved hard to come by, with only seven of their 33 goals being shared between Scott Vernon, Calvin Zola and Josh Magennis. 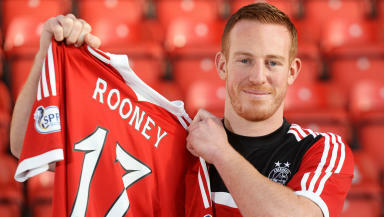 Rooney will wear the number 17 shirt which was vacated by the recently departed Gregg Wylde.